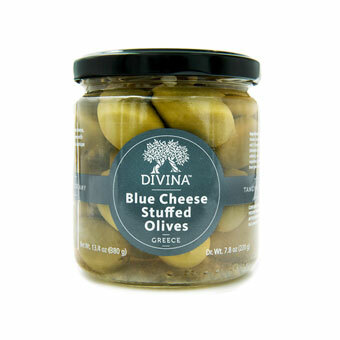 Smooth and buttery Halkidiki olives from Greece are hand-harvested when they are young, patiently cured, and then hand-stuffed with rich, creamy blue cheese for an olive that is perfect on its' own or as an appetizer bite! With a delicious crunch, full flavor and a slight, somewhat peppery tartness, you will love them in salads, or as a garnish for the ultimate martini! 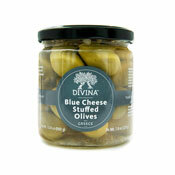 Divina produces estate-grown Halkidiki stuffed olives from Mount Athos, or Algion Oros, as it is locally known in the Halkidiki region of Greece. Mount Athos occupies the best part of the Athos peninsula in Halkidiki, a rugged sea-battered peninsula 56 kilometers long. Because of its isolation, Mount Athos has remained one of the most unspoiled areas of Greece. The long process of creating olives with exceptional taste and texture begins by working with the finest small farms throughout the Mediterranean. The olives are hand-picked and hand-sorted, then cured using an all-natural fermenting process that fully preserves the natural flavor of the olives. 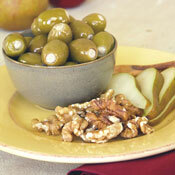 A Halkidiki olive is large and pale green with an oval shape. They are usually harvested when they are young. 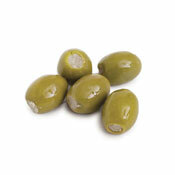 Brine-cured, Halkidiki olives have a firm textured meat with a delicious crunch and full flavor. The taste is slightly tart and somewhat peppery. The size and shape of the Halkidiki olive make it ideal for stuffing. A little something extra: The region of Halkidiki is also the birthplace of the famous philosopher Aristotle!